Lore: Crowd Source Edition - "The Wheel"
All hands on deck! "What is The Wheel?" you might ask. Check out the canon link above, as well as where it's located in the universe. As far as I am aware, there isn't a current location submission for it, as it's a canon location. What I'd like to do is create a Codex entry for the station itself, noting important features and presences as well as pay attention to the pre-existing lore and stories people have had utilizing this iconic space station! 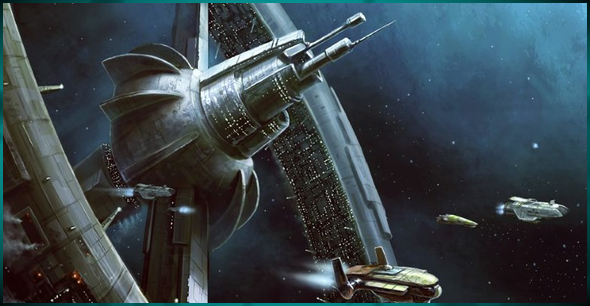 I've seen other codex entries take off really well by crowd sourcing, and would love to hear stories you've had on/involving "The Wheel" as well as to develop a great location sub so that it's easier to understand the current state of the station itself. Currently, it resides in free space, but it is my understanding that there are a few people who might know more as far as existing lore is concerned and as to the current state of the station. I'd like to take these into account when making the submission. Any help you all could provide would be greatly appreciated! Ultimately, I'd like to create a codex submission that would detail the history of The Wheel on chaos, as well as allow people to establish shop/storefronts or other things like lodging or embassies on The Wheel. Since it's a canon location I figured a location submission would be more appropriate than a factory submission, but if I'm wrong, please let me know. Alternatively, we could include some of the factory template in the description via word picture. I believe Popo did a ton of Wheel-related stuff a couple years back, fitted it with some cool systems, etc. Ember visited there once, and I got to use some of Popo's stuff, but nothing big-picture important happened. The Mandalorian Clans dom'd the Wheel twice. Nothing much happened, but it is part of the space station's history. Also, SSC dom'd the Wheel too. Hope these are helpful in some way. Edited by Briika Tor-Munin, 20 February 2018 - 02:27 PM. Hi there, I'm Popo. Did a whole bunch of stuff there in the past and actually wound up buying the place years ago from the Sith empire at the time. Ran it ever since, though I've not been hugely active on Popo for a short bit due to RL stuff. It's the headquarters of Tenloss Corporation and basically the hub of all things Popo. Anything specific you need to know? Thanks! I'll have to give those a read! I'll start filling out a bit of the template and see if I can't get a google doc up at some point. A few of the most notable questions off the bat I had I'll list below! 1. What is the governing agency aboard The Wheel? (What does the security look like, "Wheel Security Corps"? Tenloss Private Security? Are they dressed like private security or are they more "Thuggish" in appearance? 3. As far as ownership goes, is there a percentage breakdown of who holds shares/the ownership? i.e. Tenloss 90%, Cartel #1 5%, Cartel #2 2%, Private Ownership 3% or something that breaks down the actual operation/corporate interests there? 4. While the station is open to all, are there any arms restrictions? Security to prevent armed people from strolling down the main concourse with a blaster at their hip? 5. How does the shipping work, is there a dedicated "Market/Import Export" dock/hangar where merchants and traders (Smugglers too!) primarily berth and conduct business? I'm sure more will come, but I just want to add as much detail as I can, this is a really great opportunity to provide a rich RP environment! They're dressed in Champio-class armor made by Tenloss, so they're essentially wearing what amounts to top quality military grade body armor and use appropriately military grade weaponry. 2. I always just tell people to assume that one of the sections of the Wheel is given over to embassy type things. Faction wants an office, they have it. They pay rent, of course, but that's essentially background noise in a grand RP sense. 3. While Tenloss is headquartered at the Wheel, Popo as an individual owns the station in it's entirety. 4. The station is open to all and it is actually required by negotiation that no matter what faction it is, they have full access to the Wheel itself. The station is sovereign territory and operates by it's own laws. The system itself outside of a small buffer belongs to whichever faction. As for weapons, anything that can compete with security is barred. So, assault rifles and such won't be allowed, but a sidearm can slide through for an additional fee on entry. 5. Shipping is controlled through the typical ways. Not much is illegal on the Wheel outside of military grade weaponry, but so long as you use common sense, do your thang as you want. Lemme know if you have more questions!